Hands-free presentation or recording without all the usual hassle of wires and belt packs? Here's the solution - Samson's neat little MICRO EARSET system. Just hook the headset transmitter over your ear and you're all set. Your words of wisdom are now being transmitted wirelessly to the system's AR2 battery receiver. This can be connected to a solid state sound recorder, PA system or video camera. So many uses. The AirLine Micro Earset Wireless System is a breakthrough that utilizes the latest in lithium ion battery technology and small, high-quality audio and RF components to bring performance freedom and convenience to a new level. The result is not only the smallest wireless system we offer, but probably the most comfortable too. 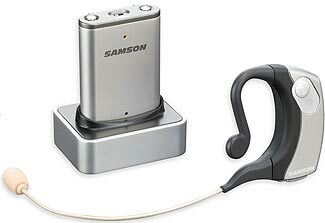 To eliminate continually changing batteries, Samson has designed this micro-size UHF wireless system to be fully rechargeable, supplying lithium-ion rechargeable batteries and USB DC power inputs for both the AH2 earset transmitter and AR2 receiver. A handy docking station for the receiver also provides a USB DC input and a 3.5mm balanced audio output. Because of these convenient recharging capabilities, the days of constantly changing the batteries in your wireless system are over. Leaving beltpacks behind, this system uses the all-in-one AH2 Earset, a complete transmitter headset for total freedom and uninhibited movement. The transmitter's omnidirectional microphone ensures your voice is picked up and amplified even during periods of fast, heavy movement. Plus, its water resistant design protects the mic and transmitter from moisture and perspiration that can accumulate during intensely active performances. Despite its modest size and inconspicuous appearance, the AR2 receiver boasts meticulous engineering that provides AirLine Micro with professional sound reproduction and exceptional reliability. The AR2 also houses a rechargeable battery that will offer about seven hours of operation. 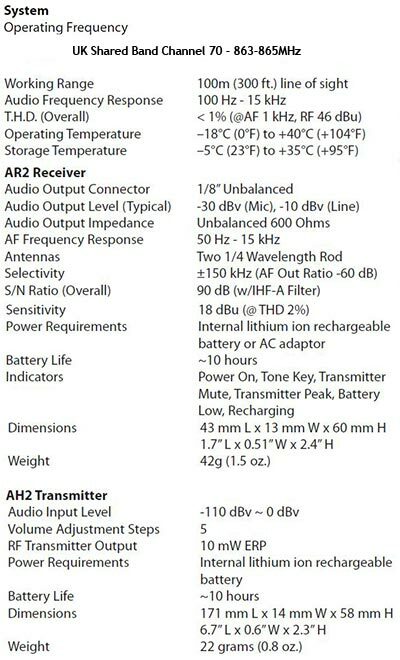 A 3.5mm unbalanced mic/line level output and USB DC power input complete the features on the receiver. Applications for the Micro EARSET system include: fitness & aerobics teaching, music/dance/theatre performances, public speaking, lecturing, teaching & corporate presentations. The MICRO EARSET system is available on TV Channel 70 which gives you a choice of 4 deregulated (legal and free to use) UHF frequencies [Channel 70-1: 863.125MHz; Channel 70-2: 863.625MHz; Channel 70-3: 864.500MHz; Channel 70-4: 864.875MHz].